This week marks the 100th anniversary of the sinking of the luxury ocean liner, R.M.S. Titanic. The vessel was on its maiden voyage from Southampton to New York City when it struck an iceberg on the night of 14 April 1912, sinking in the early hours of the morning. The ship was supposed to make history through its luxury, power, and efficiency. However, after fatally colliding with the iceberg, it still made history but in a much more profound and unintended way. The incident resulted in the deaths of 1,517 people, making it one of the worst maritime disasters on record. Moreover, it was a watershed moment in human history: it highlighted the limitations of technology and the idea of human infallibility. 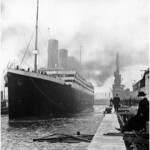 But it also spurred a memory industry that has continued to re-remember the ship and its fateful night in April 1912. As the centennial anniversary of this event approaches, we will be bombarded by television specials and radio spots that commemorate its history. Most notably, James Cameron’s blockbuster and Academy Award winning film, Titanic (1997), was re-released on the silver screen on 4 April 2012, enhanced and in 3D format. In addition, the M.S. Balmoral recently set sail from Southhampton on 8 April as part of Miles Morgan Travel’s promotional Titanic Memorial Cruises for the month of April. The Balmoral and another ship scheduled to depart on 10 April will both replicate the Titanic’s maiden voyage albeit with a few minor adjustments to compensate for technological improvements. Tempting fate or paying homage in a peculiar way? As an historian I am curious about the ways in which the Titanic has been remembered by different groups and individuals over time. French philosopher and sociologist Maurice Halbwachs has argued that there is not only individual memory, but also group or collective memory. Furthermore, the collective memory of a group is dependent upon the framework to which that group is exposed and how they are situated in society. Consequently, there is, as Halbwachs wrote, “no memory without perception.” For many of my generation, it is probable that Cameron’s film was our first exposure to the catastrophe and may have been critical in generating interest in the history of Titanic. However, some have argued that the film is historically inaccurate and thus should not be viewed as a piece of historical media. Perhaps, but the film has engrained itself into our collective memory. Bad acting aside, it has been significant in shaping our perceptions of the historical event. Besides, numerous Titanic­ inspired books, films, and other artifacts over the years have challenged the notion of historical authenticity. German artist Willy Stöwer created one of the first visual representations of the event in 1912 with his painting, Titanic Sinking. Although iconic, the work contains a few noteworthy errors, such as the inclusion of numerous large icebergs in the background and smoke billowing from the ship’s fourth funnel. In reality, Titanic only had three operational funnels, with a fourth dummy funnel erected to make it appear that it was on par with the speed and power of rival ships, the R.M.S. Lusitania and Mauretania, both of which had four operational funnels. Yet, it is still one of Stöwer’s most widely circulated and famous works. Since no photographs of the sinking exist, artistic renderings of the ship’s demise were the most powerful way for people to visualize an unfathomable tragedy. In 1955, Walter Lord published A Night to Remember, a book that is still regarded by many as the definitive source about the ship and the sinking. Three years later, it was adapted for the silver screen, bearing the same title, and is still regarded by some as the most accurate Titanic film – including Cameron’s. Yet, Roy Ward Baker, the film’s director, depicts the ship sinking in one piece. While we know today this is inaccurate, it was unknown at the time. Robert Ballard did not discover the wreck of the ship until 1985; before then, it was unclear if the ship had broken in two. Even so, does it matter that the above-mentioned painting and film are not entirely historically accurate? Do we as historians have to pass judgments on historical representations outside the academy? I do not believe that the historian is the ultimate arbiter of history, and therefore efforts spent policing the commemoration of Titanic or other events would be a futile exercise. After all, these representations are already part of the collective memory of our generation and those before us. The long-term viability of these paintings, books, and films has demonstrated their significance, and are therefore no less important than the works of historians. People have also commemorated the Titanic in much more bizarre ways in recent years through the production of memorabilia. Some of these representations might be a little less tasteful than others, but it does not necessarily mean they are less important in the construction of how we remember Titanic. More importantly, with the increasing importance of global online commerce, many of these representations have allowed Titanic to transcend books and cinema. 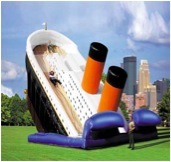 Individuals unsatisfied with Roy Ward Baker’s or James Cameron’s big screen sinkings can actually order a giant inflatable slide that is supposed to recreate the final moments of the disaster, when the ship’s stern broke apart from the main haul before plunging into the Atlantic. Anyone looking to plan a party in April can order from the slide from Party USA. 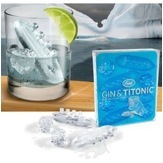 But if you really want to break the ice at your next party you should order the Gin & Titonic ice cube set from Fred & Friend’s. Rather than chilling your drinks with standard cubes, the moulds give you the option of either sinking ocean liners or icebergs into your drink of choice. 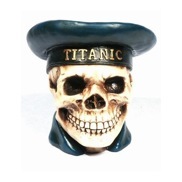 Instead of spending your money on Titanic themed party novelties, you could save up with a piggybank from Amazon that comes in the shape of a skull of a former R.M.S. Titanic sailor. A great way to teach your children the value of savings and ensure they develop an aversion to maritime travel. 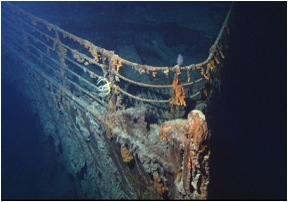 The commemoration of Titanic raises some important issues for historians and the public at large. Is there a best way to remember something? And more importantly for historians, do all interpretations of a historical event need to remain absolutely true to history? Even if they do not, there is no stopping or denying the significance they can have on shaping society’s perception of a given event. 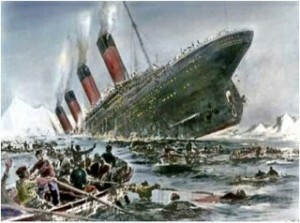 The year 2012 is far from over, and Titanic is just one episode that will be remembered and debated this year. From now until 2015, the bicentennial of the War of 1812 will be commemorated. It should prove to be a contentious time for Canadian historians. Mike Commito is a second-year PhD student at McMaster University. His dissertation, tentatively titled ”Orphaned Cubs and Responsible Hunters: Conflicting Values and the Management of Black Bears in Ontario, 1900-2000? focuses on the development of black bear hunting policy and management strategies in Ontario. He is interested in how various groups in the province such as biologists, policy-makers and the lay public viewed bears and how this perspective has changed over time.